After her education in Cologne and Berlin she made her debut in 1910 at the Komische Oper in Berlin. 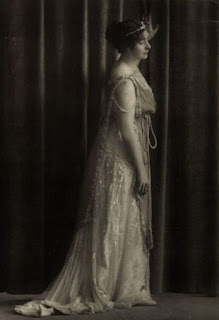 In the 1911-1912 season she sang at the Stadttheater of Kiel, from 1912 to 1924 at the German Opera House (Städtische Oper) in Berlin, where she had a huge success. Here she created in 1913 the part of Minnie in the premiere of G. Puccini's "La Fanciulla del West", in 1919 Fiora in the German premiere of I. Montemezzi's "Amore dei tre Re". In 1914 she appeared there in the world premiere of the opera "Mandragola" by Ignaz Waghalter. From 1924 to 1932 she worked at the Staatstheater of Hannover. Here she appeared in 1927 in the premiere of opera "Herrn Dürers Bild" by J. G. Mraczek. She made guest appearances at the major German opera stages and in Holland and was known for her concerts on German radio. In 1932 she gave up her stage career. She spent her old age in Oberstdorf, Allgäu.